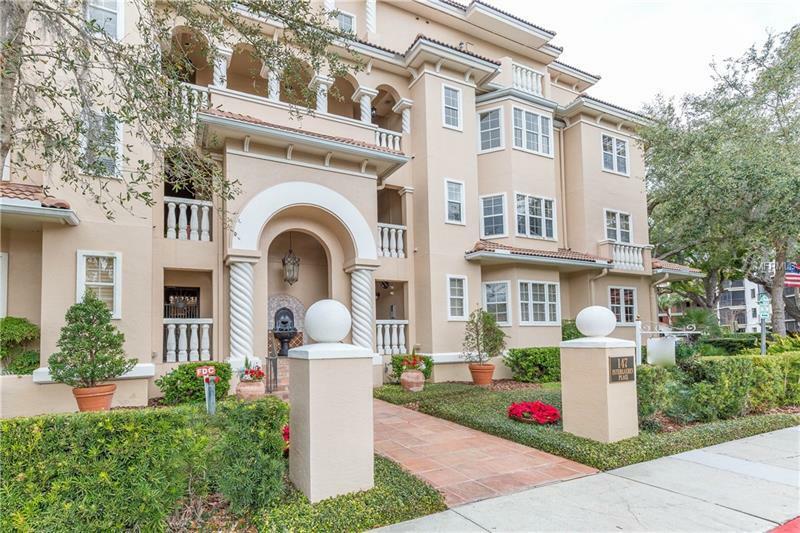 Enjoy the comforts of downtown Winter Park living in this spacious luxurious condo with 3 bedrooms and 4 1/2 baths. This sophisticated Mediterranean style gem features a formal living room with fireplace French doors leading to 2 balconies a family room complete with wet bar a formal dining room and eat-in kitchen. The beautiful master suite includes a sitting area fireplace his and hers sinks walk-in closets and a whirlpool tub. Accents that include columns arches and a tiled roof add to the spectacular elegance of the building which includes a private secluded pool with pool bath and Spanish-tiled center courtyard with a fountain and tropical palms. Just steps from Park Avenue restaurants and boutiques this 3272 square feet condo is ultra secure with TV camera gated entry a keypad elevator and a full security system. Includes underground parking and a secure storage room.